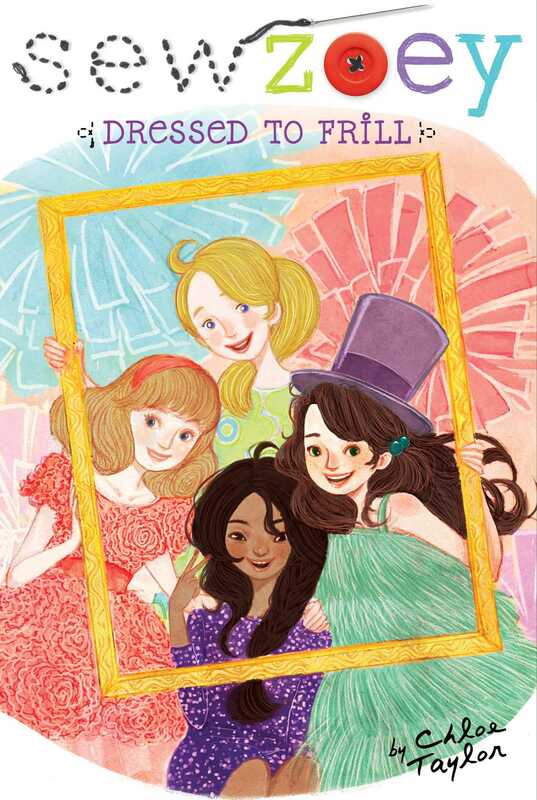 Zoey and her friends are dressed to the nines for Libby’s bat mitzvah—but will things fall apart at the eleventh hour? Includes “Sew Zoey” blog posts and fashion illustrations. I know you’re not supposed to enjoy being “fired” from a job, but I’ve been all “fired up” with new ideas for outfits since getting kicked out as treasurer of the Fashion Fun Club. See the fruits of my labor (or of my firing?) in the sketch! Aunt Lulu said maybe the club was too much of a good thing. That sometimes you need to take a break and do something completely different (and for me, that means not sewing related), so your mind can wander to new and exciting creative places. It’s also really nice to have time to do nothing at all! That’s why I love volunteering at the pet shelter. With all those adorable dogs and cats to walk and play with, you never know what’s going to happen next. I always come away with more energy for my sewing projects. We’re starting the next elective in school soon. I’m excited to try industrial arts. I wonder if I can somehow figure out how to combine woodworking and fashion. But how would you sit down in a wooden dress? Hmm . . . will clearly have to give this a bit more thought. The girls were in their pajamas, lounging around on Libby’s bed. It was sleepover night at the Flynn house. “What made you decide that?” Zoey asked. Kate had broken up with Tyler Landon, who’d had a crush on her, a few weeks earlier after only a few dates, partially due to Zoey’s misguided attempts to help him woo her. Under Zoey’s helpful advice (which turned out to be not so helpful after all! ), Tyler had been behaving differently than usual because he’d thought it would make Kate like him. “Well . . . we have a great time together when we volunteer at the food pantry,” Kate said. “Not to mention the fact that he’s supercute,” Priti observed. Now it was Zoey’s turn to blush. “I was only trying to help,” she said for what must have been the umpteenth time since her matchmaking fiasco. “You guys seem to have a lot of fun when we’re at the food pantry,” Libby observed. She’d started volunteering there, in addition to her school community service at the pet shelter, so she had seen Kate and Tyler together. “I guess,” Kate mumbled, blushing a little. “Well, since we’ve agreed that Tyler is supercute, can I show you something superexciting?” Libby asked. Libby jumped off the bed and went to her desk. Libby climbed back onto the bed and sat cross-legged. “A few years ago, I wasn’t even sure I was going to have a Bat Mitzvah. Dad’s Catholic and Mom’s Jewish, but neither of them are that religious. We celebrate all the holidays, but more the traditions than the religious stuff,” she explained. “So what made you change your mind?” Zoey asked. “Zoey always gets right down to the important questions,” Priti said. “Party? Did you say party?” Priti perked up immediately. “So . . . you read from the scrolls during a service, and then there’s a big party with yummy desserts? That’s a Bat Mitzvah?” Zoey asked, wanting to make sure she had it straight. “What’s your project?” Kate asked. “Who are you inviting?” Zoey asked. Zoey couldn’t believe her ears. Zoey wasn’t happy about it either. Emily had taken over from Ivy Wallace as the head mean girl. “We’ll be having so much fun, we won’t even notice she’s there,” Kate said. “While you’re at it . . . ,” Kate added. “I hope I finally get this stuff right by the time your Bat Mitzvah happens!” Zoey groaned. “Is that the sideways dance?” Kate asked. She gave them a quick lesson in the hora’s footwork. “Oh! It’s kind of like doing the grapevine, but in a circle,” Zoey said. By the time Mrs. Flynn told them to go to bed, the girls were tired from so much giggling and doing the hora around the living room, and Zoey felt much more prepared for Libby’s Bat Mitzvah.